We have a habit of recreating teas that other companies discontinue, as our clientele knows we can find the taste they were missing, though our versions are usually proclaimed as far better than the originals. 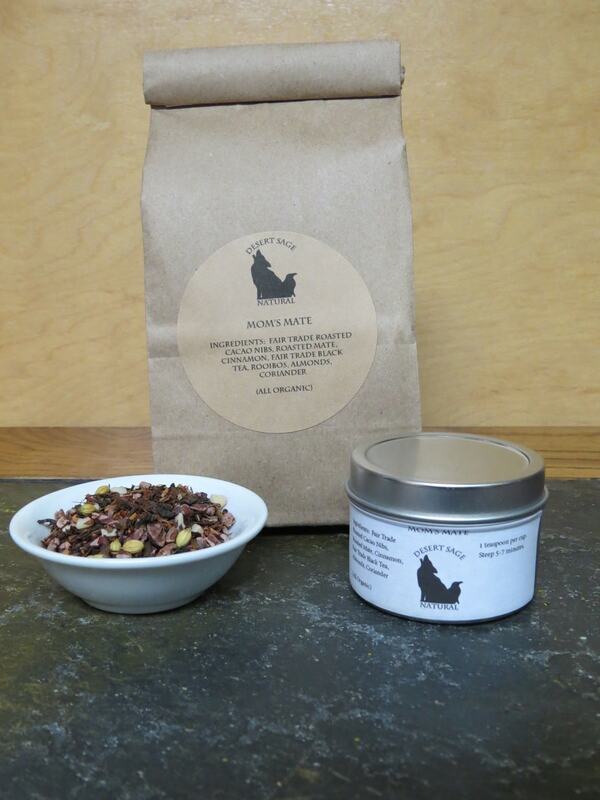 ‘Mom’s Mate’ started as a small bag filled with tea for us to test, and a list of ingredients that terrified me. Mostly because it seemed ridiculously long. (I think there were 37 ingredients?) I understand that you can attempt to pack more things into a tea when you are primarily using flavour oils, especially if you reach for the chemically created ones, but it still seemed more than a little over the top. We tested the tea, and over the course of the tasting, I chose the tastes that actually seemed to be in the tea, and settled to figure out ratios and blending. When we are asked to recreate a tea that involves a blend of different types of teas, we start with the foundational tea blend. Getting the starting point solidly right just seems the best idea. 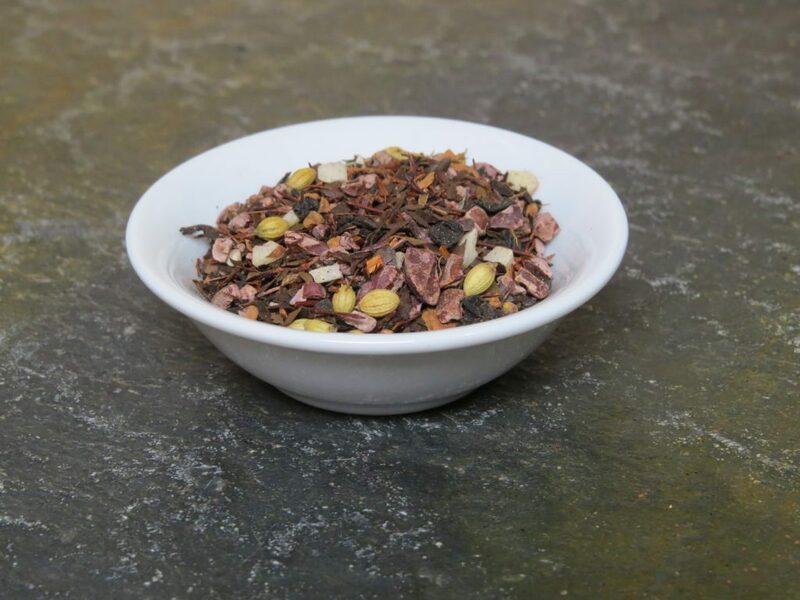 When we finished up with the blend of Mate, Rooibois, and Black Tea we decided we liked that combination on its own, and it became our TriForce Tea. (This turned into a geek-tea-splosion, and three other teas were created around the theme.) So the request for ‘Mom’s Mate’ actually ended with us creating five teas. Once we had the foundational tea blend sorted, we started working with the rest of the ingredients needed to get the taste right. It is our first tea utilizing coriander, and it has become a new tool in my tea-toolbox because I liked the way it worked out. It adds something lovely to the cinnamon, chocolate, and almond – and the three teas work better together than I had imagined they could. As this was a tea blended for my mother, and one I was truly happy to have been asked to make, we named it in salute to her. *If you choose a full batch of teabags, there will be overflow that doesn’t fit into our standard bag. We will need to know if you would prefer a second bag, or a vacuum sealed package for the extras. This entry was posted in Black Tea, Chocolate, Mate Tea, Nuts, Red (Rooibos) Tea, Simply Tasty Teas and tagged Custom Tea, Organic Almonds, Organic Black Tea, Organic Cinnamon, Organic Coriander, Organic Fair Trade Cacao Nibs, Organic Roasted Mate Tea, Organic Rooibos Tea by DesertSage. Bookmark the permalink.